The prodigious quantity of causes ... troubles us, makes us afraid, and hides from us the secret of the Creator. It is beneath appearances that are deceptive only to us that is hidden the wisdom of His admirable operations...So much has research into effects been neglected in favour of causes, that all we have done in physics is babble. If Nature is better known today than in the centuries of ignorance, it is because we apply ourselves more to the knowledge of effects than causes, and we use the accumulated knowledge of these different effects to find true causes. 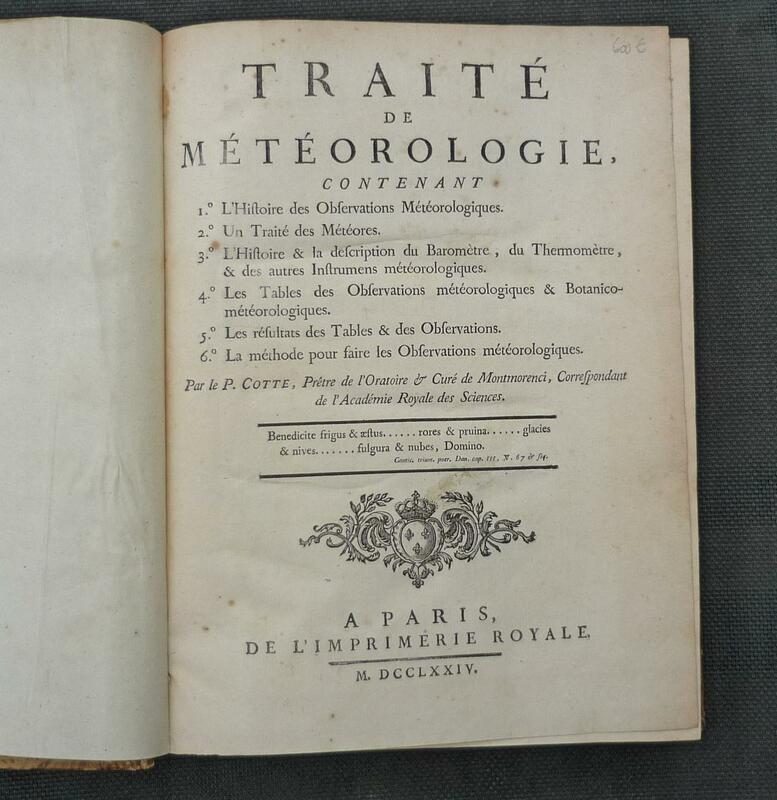 The first significant series of air temperature readings in France was begun at the newly constructed Royal Observatory in 1669 by Philippe Le Hire (1640-1718) and continued after 1720 by Jacques Philippe Maraldi (1665 - 1729). A geometer and surveyor, Le Hire's interest in meteorology was prompted in the by his surveying work in the 1680s for the water supply at Versailles. 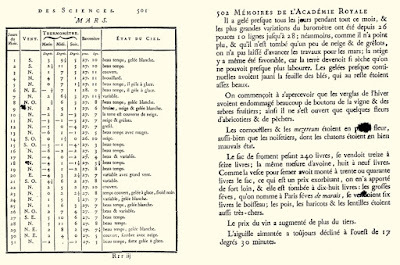 As he explained in a memoir of 1704 the practical requirement of Louis XIV's cisterns prompted him to make exact observations of rainfall; he noted that it rained more when the air was lighter as measured the descent of the mercury in the tube of the barometer and resolved to compare rainfall with both air pressure and temperature. 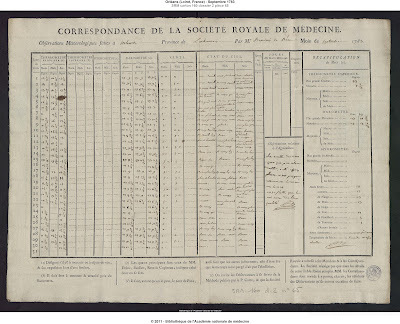 Le Hire's complete registers of temperature readings do not survive, only his summary reports to the Academy of Sciences which were concerned mainly with annual extremes and unusual weather events. 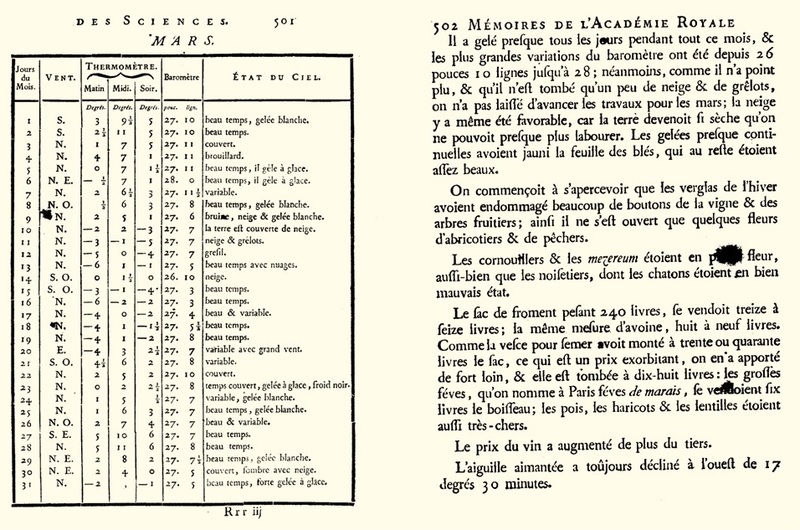 The first complete series of observations for France were made by the Parisian botanist and doctor Louis Morin (1635-1715). Morin was a physician of some repute, numbering Boileau, Racine and the Princesse de Joinville among his patients. After the death of the Princess in March 1688, he retired to the Abbey of Saint-Victor near the present site of the Jardin des Plantes. In 1692 he was made a "Botanical associate" of the Academy of Science and 1707 became a full member, succeeding Louis XIV's doctor Denis Donard. Fontenelle's official Eloge, noted that his life observed "an order almost as uniform and precise as the movements of the celestial bodies". Since Morin was a botanist and physician rather than a physicist, he presumably hoped to elucidate the influence of climate in these areas, though his work seems never to have progressed beyond the collection of data. Morin's metereological registers span a phenomenal forty-eight year period, from February 1665 to July 1714. He took readings three or four times a day, including measurements of temperature, barometric pressure and humidity (hydrometry), plus observations on clouds, direction and force of the wind, rainfall, snow and fogs. The most complete series are the thermometer and barometric readings [Manuscrit. Ms 1488, Bibliothèque de l’Institut de France, Paris] In 1992 the metereorologists Jean-Pierre Legrand and Maxime Le Goff were able to use this register to reconstruct daily temperatures for the period 1676-1713. After 1715 there was a general upsurge of interest in the collection of meteorological data among the learned societies of Europe, coupled with a recognition of the need for networks of observers.Johan Kanold in Breslau compiled readings from a dozen locations across Europe, and in 1723 James Jurin, the secretary of the Royal Society, laid out a plan for daily recording of barometer and thermometer readings, wind strength and direction, precipitation and state of the sky. The English network eventually boasted fifteen observers, ranging from Bengal and St. Petersburg to Massachusetts. The weather diaries were collated by the indefatigable William Derham who was a Fellow of the Society. With the mid-century France came a new awareness of the importance of the study of climate for public health and agriculture. The term"climat" in this period encompassed a whole range of environmental conditions, not all of them strictly atmospheric. ( See Montesquieu's famous speculations on the relation between "climate" and national character in L'Esprit des Lois, which was published in 1748) In medical theory "humours"were replaced by the idea that environmental factors - hot cold, wet, dry - acted mechanically on the body. 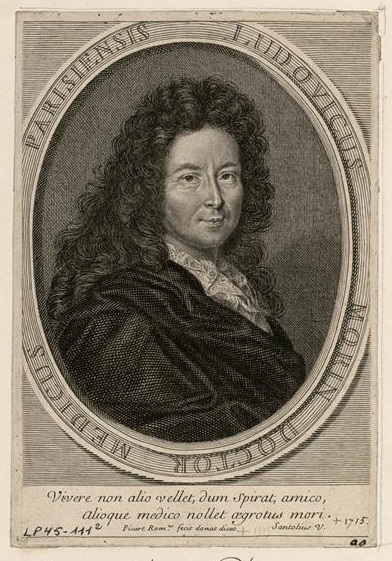 Exponents hoped to correlate weather patterns with disease; as for example, Paul Malouin in his History of epidemic diseases, observed at Paris, with differences of air temperature, which was published annually from 1746 to 1754. Agriculturalists boasted less theory, but there was a general perception that the success of crops could be studied in relation to the weather. The chief observer at this time was Henri-Louis Duhamel du Monceau (1700-82). who from 1741 to 1780 addressed to the Academy of Science a series of annual Botanico-Meteorological Observations in which he presented tables of meteorological data and general remarks on crops and public health. His efforts provided an important model for later initiatives. In the second half of the century, particularly in the decades 1770 to 1790, the study of medical and agricultural climatology expanded in line with growing government intervention in public health. The number of observations (measured in "station-years") doubled twice over, and there was a corresponding increase in publications. The key institutional development was the foundation in 1778 of the Royal Society of Medicine which, founded in response to a devastating outbreak of cattle plague, had a strong interest in epidemiology. 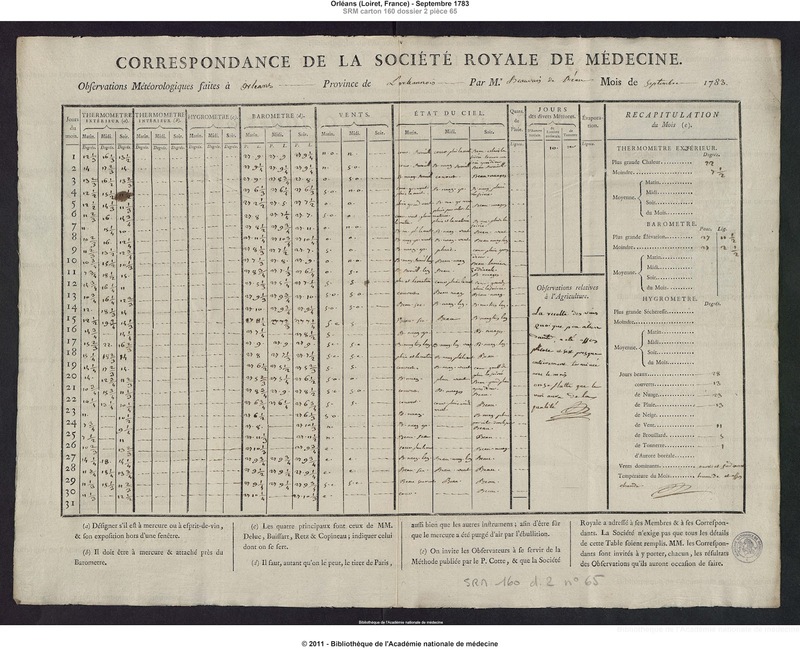 By the 1780s the Society had established a network of 150 provincial physicians who generated a mass of meteorological observations from all over France. The organisation included provision of several calibrated barometers set up by Antoine-Laurent Lavoisier, who planned to extend this system throughout Europe, The work of co-ordination and collation was undertaken by Father Louis Cotte (1740-1815), who was in charge of the Oratorian observatory at Montmorency just outside Paris. 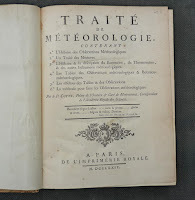 In 1774 père Cotte had published a pioneering Treatise on Meteorology, planned as a continuation of Duhamel's "botanico-meteorological" investigations and stating clearly that the goal should be "the perfection of the sciences of agriculture and medicine". He made his own observations with the aid of a barometer installed in an unheated room, an alcohol thermometer and an udometer to measure rainfall. The collective findings of the Society were published in the form of monthly summaries for each location, based on data reported in standardised forms. The scope of this work gave Cotte some insight into the geographical extent of weather phenomena and allowed him conclude that given variables might define regional climate. Nonetheless, he did little with his data, much of which remained unpublished and unstudied until the work of modern climatologists. Legrand J.-P. et M. Le Goff, 1992 : Les observations météorologiques de Louis Morin. Monographie n° 6, Direction de la météorologie nationale, tome 1, 36 p, tome 2, 176 p.
Pierre Caron, Le père Cotte: Inventeur du thermalisme enghiennois et de la météorologie moderne. Éditions du Valhermeil, Saint-Ouen-l'Aumône, 2002, 133 p.